Tired Hands is the brainchild of Jean Broillet IV and his wife Julie Foster. Jean began as a homebrewer, but quickly turned professional, starting at Weyerbacher Brewing Company where he learned the ins-and-outs of the brewing business. Eventually he moved on to the Iron Hill Brewpub in West Chester, PA (just down the road from me) and it was there that he fell in love with the brewpub model. After several years, he set plans in motion for his own brewpub, eventually landing in Ardmore, PA. 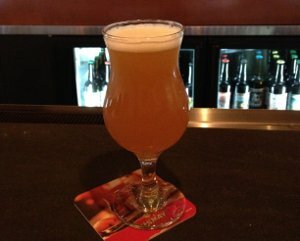 The greater Philadelphia area is home to numerous breweries, but few seem to inflame the passions of the Beer Advocate set (this isn't to say they're not any good, but that's a topic for another post). 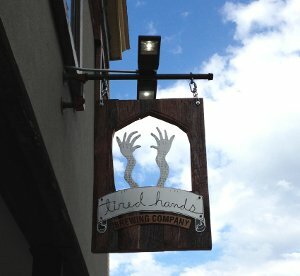 Tired Hands looks to be a local brewery that will join the rarified few that amaze beer dorks like myself. Drawing inspiration from the farmhouse brewers of France and Belgium and the heavy handed hop-heads of the US, Tired Hands has already made a splash, just a few short months after opening their doors in June, 2012. Just to give you an idea of how well their launch has gone, they've already collaborated with the insanely popular Hill Farmstead on a couple of beers, which naturally brought many beer nerds to attention (the first time I heard of Tired Hands was at the Hill Farmstead event during Philly Beer Week). Being a fool (or perhaps just because my liver wasn't up to the task), I didn't get to try that collaboration. But all is not lost, as they're a reasonable hop and skip away, and I've lately thought it would be interesting to take a look at the smaller brewers of the area. And Tired Hands is indeed quite tiny, focusing on small batch brews (their website sez they make twelve-keg batches) and uber-local foodstuffs. It's not quite a full-blown restaurant, but they offer a nice selection of fresh baked bread, local artisanal cheeses, and charcuterie. Which, quite frankly, is enough for me! Beer Nerd Details: 5% ABV on tap (8 oz). Drank out of a wine glass on 8/18/12. Beer Nerd Details: 7% ABV on tap (4 oz). Drank out of a mini-pint glass thingy on 8/18/12. Beer Nerd Details: 5.1% ABV on tap (4 oz). Drank out of a mini-pint glass thingy on 8/18/12. 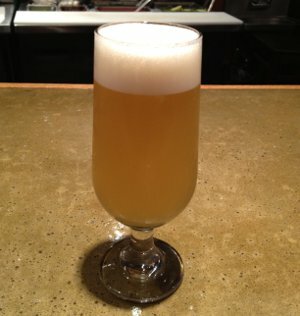 Beer Nerd Details: 7.1% ABV on tap (4 oz). Drank out of a mini-pint glass thingy on 8/18/12. Beer Nerd Details: 7% ABV bottled (22 oz bomber). Drank out of a tulip glass on 7/29/12. Hops: Galaxy, Bravo, and Citra. IBUs: 60. 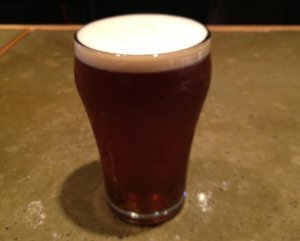 Kaedrin Simcoe IPA - My homebrewed IPA went over well, as usual, though I'm getting a little worried, as I only have a couple of these left. It is starting to show it's age a bit - much more piney than it's initial incarnation - though it's still quite nice. Definitely something I'm going to attempt to replicate sometime this winter. Solid B+ material here (maybe higher at it's peak). Firestone Walker Wookey Jack - A beer many of my fellow blogging travelers have been enjoying, and I have to say, I see what they're talking about! Of course, it's no Society and Solitude #2, but as Black IPAs (or Cascadian Dark American Black whatevers you want to call it) go, it's a solid, perhaps even top tier entry. Very nice pine tree nose, with a taste that is more hops than roast, but with both elements present and prominent. Apparently also made with Rye, which adds something different to the mix, but which I wasn't really looking too strongly for... It's a beer I'd love to try again sometime, but for now, B+ it is! Thanks for bringing this one Danur! Russian River Supplication - So I really enjoyed this the last time I had it, and I've been trying to experiment with sours at Beer Club, so I brought this one, and hoo boy... I absolutely adored this beer this time around. Not sure if it was because my palate had already been exercised by the BBQ and preceding beers, or if I just got a particularly good bottle (Batch 7) this time around, but man, this thing was spectacular. Fellow beer club peeps were also blown away by this beer, and I could hardly blame them. 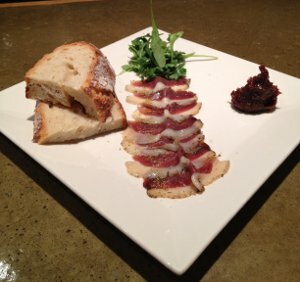 It really was quite eye opening, and it stood right up to the strong flavors we'd already been imbibing for a bit. I have to say, this time around, the sourness was less pronounced and better integrated into the beer, which took on more of an oak aged character. It's something I'm going to have to revisit again sometime soon. I give it an upgrade to an A right now, but honestly, if I get another bottle that's this good, it could vault itself up into the hallowed A+ pantheon. DuClaw Soul Jacker - A blend of DuClaw's Black Jack stout and their most excellent Devil's Milk barleywine. 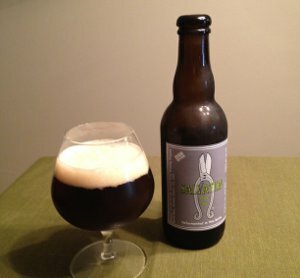 Indeed, that barleywine character, full of hop flavors (but not a lot of hop bitterness), dominated the taste. There was a very light roastiness, which added some interesting complexity. I really enjoyed this, but it also sorta made me crave the regular old Devil's Milk barleywine. I'll give it a B+ and leave it at that. Phew! I think this may be one of the best rated beer clubs evar! Only one real B-, and that's not a particularly poor rating. Usually, despite all the fun we have, there's at least something in the C or D range, if not an outright F (apparently someone forgot to bring a 3 year old San Miguel lager, smuggled from the Phillipines, that they've been meaning to get rid of - this surely would have opened some eyes in a bad way, but I guess we'll have to wait for next beer club for that... experience). Not that I'm complaining (about this gathering or, for that matter, previous gatherings with not so great beer - it's not like I have to drink a ton of bad beer or anything!). 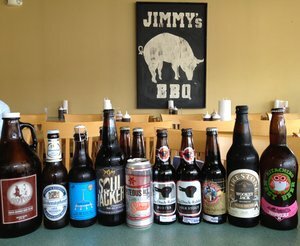 As always, I'm already anxiously awaiting the next beer club meeting! I've been at this blogging thing for a little while now (almost two years), and I've obviously been drinking beer for a long time before that... but this appears to be my first wheatwine. It's basically like a barleywine, but with a large proportion of wheat in the malt bill. I suppose the closest thing I've had to this style is Great Divide's Double Wit, a beer that didn't quite work for me. It was fine for what it was, but it felt overly boozy and unbalanced. 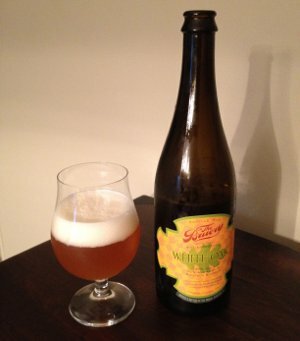 Will The Bruery be able to tame those issues in this decidedly stronger brew? To be fair, this stuff is also quite a bit more complex than any of the big wheat beers I've had before. It's a blend of the Bruery's excellent hoppy Belgian pale ale, Mischief, and a wheatwine that's been aged in Bourbon barrels (apparently they did release some of this barrel aged wheatwine all by itself, called White Oak Sap). So yeah, sign me up for this thing. Beer Nerd Details: 11.5% ABV bottled (750 ml capped). Drank out of a tulip glass on 7/27/12. 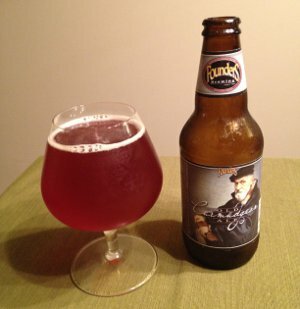 Beer Nerd Details: 7.3% ABV bottled (22 oz bomber). Drank out of a snifter on 7/28/12. Beer Nerd Details: 6% ABV bottled (500 ml). Drank out of a tulip glass on 7/21/12. Bottle sez: 062612 (presumably the bottling date). 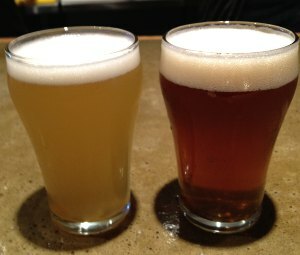 Hops: Warrior, Falconer's Flight, Simcoe. Maine continues to be a solid, interesting choice. I'll probably pick up anything new that I see from them... 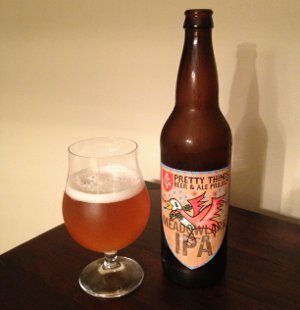 I don't have one right now, but up next will most likely be Lunch, their IPA. 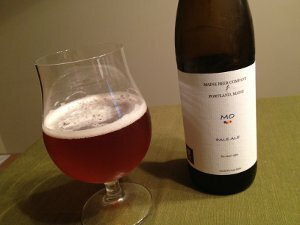 Beer Nerd Details: 9.8% ABV bottled (12 oz). Drank out of a snifter on 7/21/12. 50 IBUs. Bottled 4/19/12. There's been a lot of talk in the beer dorkosphere lately about the secondary beer market. In particular, it seems that Ebay has finally started cracking down on folks who auction off rare beers for ungodly sums of money (the loophole sellers attempted to use was to say that these were "collectible bottles" that just happened to be unopened). Some brewers are overjoyed at this prospect (for reasons we'll get into later), notably Hill Farmstead, Cantillon, and the brewer of today's reviewed beer, Russian River (said review is, uh, pretty far down in the post though). Some beer dorks don't seem to have any issue with the practice, others think this development is a good thing. Now, before I proceed, I should acknowledge that reselling beer is illegal. It's also ridiculous that it's illegal. Alcohol laws are the result of post-prohibition era governmental power grabbing and regulated profiteering. Transporting beer across state lines also illegal (along with a host of other ridiculous things, depending on where you live) - but that's something I'd wager most drinkers have done at one time or another (and something I doubt anyone but the IRS has a problem with). Regardless, my guess is that these legal reasons are really what broke Ebay down, and not the quality control or artistic integrity reasons that brewers are concerned with. Speaking of which, I have no idea what's up with brewers. There are valid reasons to dislike this practice, but they're treating Ebay sellers like they've invented some new form of puppy mutilation or something. Granted, it must be difficult for brewers to work long and hard producing great beer, then be forced to turn away valued local customers when you exhaust your supply, only to find out that some douchebag bought a case of the stuff and immediately put it up on ebay with a huge markup. Similarly, there's a worry that shipping this stuff cross-country (via consumer grade ground shipping) can result in degraded beer that will negatively impact the reputation of the brewer. These are understandable reasons to be opposed to the secondary beer market... but, you know, it's not puppy mutilation. Why does this secondary market exist? Markets represent information, and in this case, demand is clearly outstripping supply by a huge margin, hence inflated prices on ebay. Are these beers actually worth $400 or whatever astronomical price they're going for? Definitely not. This is just a demonstration of how distorted the market really is (said distortion coming from a variety of governmental and brewery factors). This is just basic economics. What's more, these brewers seem to be counting on this effect. I can't imagine that these rare specialty beers are the most profitable things a brewery makes (by themselves). 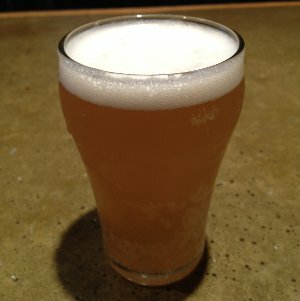 But there's clearly a big halo effect that surrounds the entire brewery when one of their beers gains a reputation as being heavenly mana from the gods. The whole point of making these prestige beers is to generate buzz for your brewery and produce a bump in overall sales. Unfortunately, the exclusivity of these special releases also creates fanatics, people who will go on Ebay and pay $500 for a single bottle, thus drawing the attention of people interested in arbitrage (and, no doubt, increasing the halo effect of such a release). This is all entirely predictable, even to someone with only a rudimentary knowledge of economics. I have to admit, it seems a little disingenuous for breweries to implement a strategy like this, then complain that people are reselling stuff for high prices on Ebay. This is pretty straightforward stuff. No one is forcing people to pay exorbitant amounts of money for rare beer online. No one is stealing the beer from brewers either. Breweries are still making a tidy profit on their beer, it's just that some of the consumers are turning around and reselling it for their own profit. What's more, the people buying these beers are no doubt true lovers of beer who are willing to shell out big bucks to get ahold of beers they would never otherwise be able to try (and also probably aware of the aforementioned potential for degradation). To me, it seems like everyone wins here. I don't know what the solution is. Having the brewer raise prices significantly may help limit the secondary market, but it will probably result in a big backlash from beer nerds. Making more of the rare beer seems like a good idea at first, but from a brewer's perspective, this makes the beer less prestigious and thus results in less of a halo effect. Also, it's probably easier said than done. For instance, beers with huge hop charges, especially when it comes to trendy, supply-limited hops like Simcoe, Citra, and Amarillo, are going to be costly and unprofitable on a large scale. Increasing production in general is a non-trivial task in itself, and it requires a massive capital investment on the part of brewers that are, in the grand scheme of things, really quite small businesses. As an aside, I do wonder if part of the reason beers like Pliny the Younger and Hopslam and some of the Hill Farmstead beers are so well regarded is that people are almost always drinking very fresh beer. I doubt bottles of Pliny the Elder sit on the shelves for a few months, and the bottle itself practically orders the consumer to drink the beer as soon as possible (so I've heard, I've never actually seen a bottle myself). Hoppy beers in particular have a propensity to degrade quickly, especially when not refrigerated, so this perhaps represents another reason a brewery doesn't want to increase production too much. Beer Nerd Details: 9% ABV bottled (375 ml caged and corked). Drank out of a snifter on 7/14/12. As usual, stellar stuff from Russian River. At this point, I've had most of their beers that have been made available in this area. I think I have a line on something new and interesting from them though, so stay tuned.